[SatNews] DISH (NASDAQ:DISH) and Southwest Airlines(r) (NYSE:LUV) have extended their partnership and the “TV Flies Free” promotion. 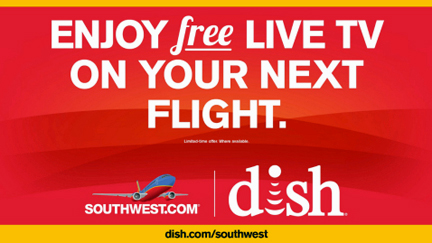 Through December 31, 2014, DISH will provide Southwest Customers using iOS, Android and most other Internet-ready devices free access to nearly 20 live TV channels and up to 75 on-demand shows on the airline’s nearly 440 Wi-Fi-enabled aircraft. Onboard access to live TV, on-demand programming and Wi-Fi connectivity is delivered by Southwest’s satellite-based inflight entertainment and connectivity partner, Row 44, a subsidiary of Global Eagle Entertainment, Inc. (NASDAQ: ENT). The program was originally announced in July 2013 when DISH and Southwest surprised passengers aboard a Southwest flight with a giveaway of free iPad® 2 devices to celebrate the new partnership. Since that time, DISH has enabled millions of Southwest Customers to watch their favorite shows in-flight at no charge. As part of the extension, DISH will continue offering new customers who sign up for the Hopper and a qualified programming package, 12,500 points in the Southwest Airlines Rapid Rewards® program and the choice of a free iPad Mini. The live TV and on-demand programming available on Southwest are part of a suite of products delivered by Global Eagle to the airline. Powered through Ku-band satellite technology, the platform, which includes high-speed Internet, messaging and destination services, is now available to customers at all stages of flight, and Southwest remains the only U.S. airline able to offer gate-to-gate connectivity and messaging services. Once onboard a Wi-Fi-equipped plane, Southwest Customers can connect to the Wi-Fi network and launch their Internet browser to be directed to the Southwest Airlines Entertainment Portal. From there, passengers can access live TV and on-demand programs free of charge, compliments of DISH.